New York City's Christmas Eve high temp was 72 F which shattered the previous record of 63 degrees. The article also notes that the December 24th temp was only a few degrees shy of the city's temperature on the 4th of July this year. When I hear a high temp record was broken by nearly 10 degrees it horrifies me. It feeds right into my fears about global warming. It's times like this I experience a palpable dread that global warming is going to kill us all in a slow series of increasingly dramatic calamities which benefit only weather.com. However I did a bit of research that made me feel better, so I wanted to pass it on. 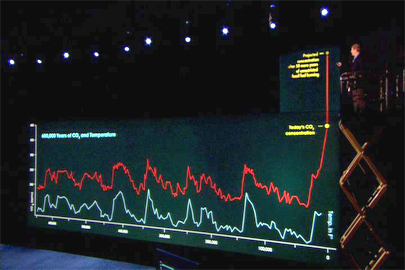 Those maps always mixed in my mind with Al Gore's 2006 movie which contains the visual stunt where has to be raised up in a pneumatic lift because the spike on the CO2 emission graph is so immense. It was a good stunt because I remember it clearly ten years later. I don't read too much about the environment but these sea level maps and Al Gore's theatrics combined in my head into a belief that the ocean is imminently going to swamp our coastal cities. I never really thought about how imminently but I figured it was only a few decades away. The happy news I found recently was that the fairly current estimates from 2013 are actually for 1 to 3 feet of sea rise by the year 2100. These are followed by more pessimistic estimates saying maybe 1m is a better minimum, some going as high as 10m, but those are not well accepted. Showing a flood map where you can choose 1m to 60m is blatant fear mongering when 1m is the accepted estimate for the next 85 years. I think these fears were mongered into my brain over the years and I'm happy to clear them out. Of course the rub is we really have no idea how to predict these things. You can read about 3D models of all the layers in the ocean and the temperatures and the salinity. And it's just the broiling stew of complexity. And then this complexity is chipping away that these equally complex ice masses, melting them in a way which only make things more complicated. Which is why the terminology of the day is to call each degree rise an experiment. Like we are doing the 1C degree experiment today. Do we want to do the 2C degree experiment? The 4C experiment? We are doing these experiments live and the outcome of the experiment is what matters not the predictions. So it's still scary stuff, but I'm comforted by "1m in 2100" prediction. 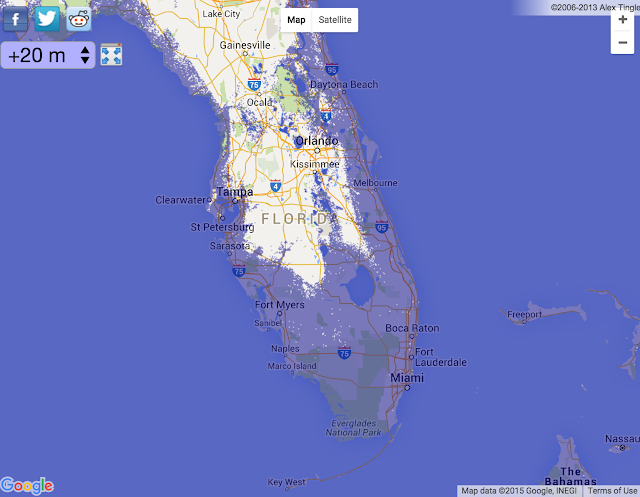 Somehow in my head I was picturing Miami would be under water in 20 years or something. I just never bothered to look it up. A few days ago Roy Scranton, someone I've never heard of, had a neat oped in the Times. He starts off by talking about free will and Nietzsche and various things to establish that he's a smart guy. Having done this he tells us that global warming is a done deal, we've lost, and we should focus on "winding down" our current civilization in a graceful way. Apparently he has a book for sale explaining this in more detail because he really does not give too much away in the piece. But he makes clear we cannot solve our problems with the "progressivist, profit-seeking, technology-can-fix-it ideology of fossil-fueled capitalism". I disagree. I believe our best hope is to invent our way out of the problem. Given the time table above we might have hundreds of years or more to figure this out. Even if you don't at all believe in the timetable of The Singularity you can still imagine we will improve technology massively before we are under water. I think designing ridiculously advanced technologies we can barely dream of today is a totally legit plan of action. Nearly-free energy, self-replicating nano-bots to cleanup the environment, colonizing mars, things we cannot even imagine. I also believe designing an artificial intelligence which will guide us along these paths is very likely the quickest way to get there. Artificial intelligence is like a meta-invention that will lead to infinitely many concrete inventions. Furthermore I believe we as humans did exactly the right thing by starting with fossil fuels. Over billions of years the earth's environment created and stored trillions of barrels of easily burnable fossil fuels. Any budding civilization was bound to turn to these energy sources as first step to jump start progress. And it makes perfect sense that ripping them out of the ground en masse and setting them on fire would "cause some problems". The game now is can we use dirty-fuels to create a civilization advance enough to invent and implement clean fuels? Scranton says we cannot. I believe was can. This global warming thing is scary but it's not exactly Usain Bolt in terms of speediness. I'm not afraid of global warming. We should respect it and work hard it addressing it, but we'll beat it. After all if there weren't some existential threat breathing down our necks while we try to get things working it wouldn't be a very good movie would it?